People are passionate when it comes to food. No matter where you are, people light up when asked about their favorite regional delicacy. Yet where there’s passion, there’s bitter division. Just try telling a New Yorker that real pizza is deep dish and see how far you get. Ask a Chilean about the Peruvian roots of the Pisco Sour (or vice-versa) and get ready for a fight. There’s an equally bitter feud smoldering in my home state of North Carolina: the battle between Eastern and Western (also known as Lexington) style barbecue. Before getting into it, it’s important to properly define “barbecue.” In other parts of America, barbecue can refer to a few different things: a party where people are grilling (we would call that a cookout), the device used to cook meat (we would call that a grill), or the act of cooking meat on a barbecue (we would call that grilling). To native North Carolinians, the word “barbecue” refers to one thing, and one thing only: slow-cooked pork. North Carolina has a long history regarding barbecue. The word comes from the Spanish term barbacoa, which is a bastardization of a Native American word referring to a wooden frame used to cook meat over coals in a dug-out trench. Native Americans had been using this method of grilling for generations when the Spanish brought hogs to the Americas in the 1600s. As the pigs took over, pork became the meat of choice. The pits where hogs were slow-cooked over coals became popular community gathering spots central to the rural life of North Carolinians. Barbecue historians (yes, that’s a thing) generally agree that the split started in the towns and cities of the Piedmont region west of Raleigh. 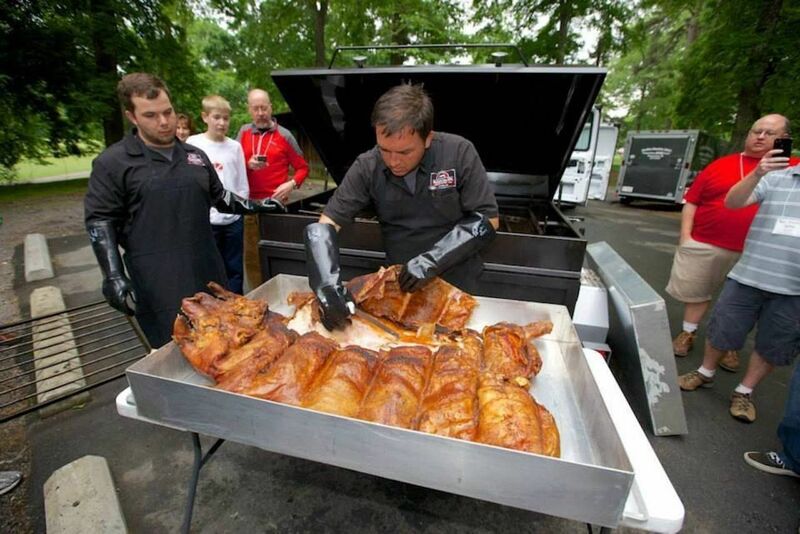 There, pitmasters started using only the shoulder of the pig. More importantly — and much to the consternation of Easterners — vendors started adding ketchup or tomato paste to the traditional vinegar sauce. This sauce, also called “dip,” seasons the meat as well as the coleslaw, which turns red as a result. The style grew in popularity throughout the Piedmont region. It especially took hold in Lexington, North Carolina, which became the center point for Western-style barbecue. Many of the style’s founding fathers opened restaurants in Lexington that are still open today, which is why Western-style is also commonly referred to as Lexington-style. Barbecue is big in Lexington. The town of just under 20,000 hosts an annual barbecue festival that draws upwards of 175,000 attendees. The only thing bigger than the festival is the political controversy that started here and spread throughout the state from 2005 to 2007. It started with an elementary school civics project. Students wrote to state lawmakers to ask that the Lexington Barbecue Festival be named the “official state food festival” of North Carolina. 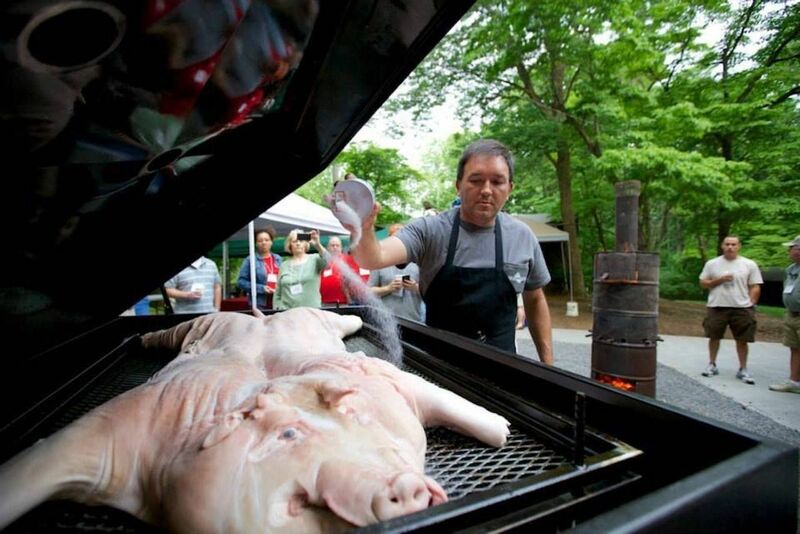 The lawmakers agreed, but when the bill was introduced in the state House of Representatives, it called for the festival to be dubbed the “official state barbecue festival” of North Carolina. This sparked immediate outrage from Eastern lawmakers who surmised that if the Lexington festival became the official barbecue festival, then by extension, Lexington-style would become the official state barbecue style of North Carolina. And that simply could not stand. The barbecue bill sat in legislative purgatory for nearly two years. All the while, its mere existence stoked the fires of the East-West feud, and geographical tensions bubbled to the surface. Newspaper columnists dueled in the public forum, with one claiming of the Lexington ilk, “People who would put ketchup in the sauce they feed to innocent children are capable of most anything.” And while the war of words kept a mostly playful tone, it solidified the rivalry as a part of North Carolina identity and gave everyone a chance to make sure they knew for good which side they came down on. In the end, the dispute was resolved by House Bill 433, which designated the Lexington festival as the “official food festival of the North Carolina Piedmont Triad.” An absolute cop out of a bill, it at least assured that lawmakers on both sides of the East-West divide kept their jobs. In a fight this big, it’s impossible to stay on the sidelines, and I’d be lying if I said I could look at this debate impartially. As a native of the Piedmont, I grew up eating Lexington-style, and I have no doubt that it’s the superior style. Why? Because the ketchup gives the sauce a tangy quality that’s missing in Eastern-style, and because Lexington style only uses the dark meat, which is the most flavorful part of the pig. If you’re going to try North Carolina barbecue, get Lexington-style. You owe it to yourself to get the best of the best, after all. But if you want to try both, just make sure you get it from somewhere that still makes it the old-fashioned way: pit-smoked over wood coals. And no matter which style you get, make sure you order your meal like a true North Carolinian — with hushpuppies and slaw on the side and a sweet tea to drink. Stamey’s Barbecue in Greensboro: Stamey’s opened in 1930 and today makes some of the better-known Lexington-style barbecue. 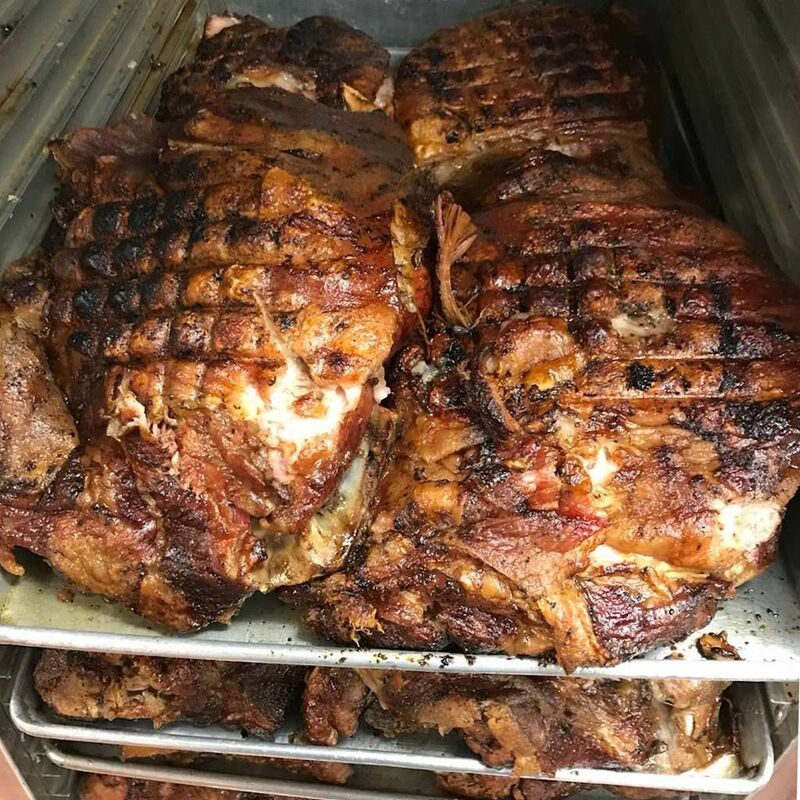 The pitmasters cook their pork shoulder for eight to 10 hours before it’s ready to serve. The Bar-B-Q Center in Lexington: The oldest barbecue in downtown Lexington that still cooks on pits, The Bar-B-Q Center maintains tradition. Make sure to save room for the famous banana split, as well. The Skylight Inn in Ayden: Open and cooking whole hogs since 1947, the Skylight Inn is also referred to by locals as Pete Jones’s BBQ. It won a James Beard “America’s Classics” award in 2003. 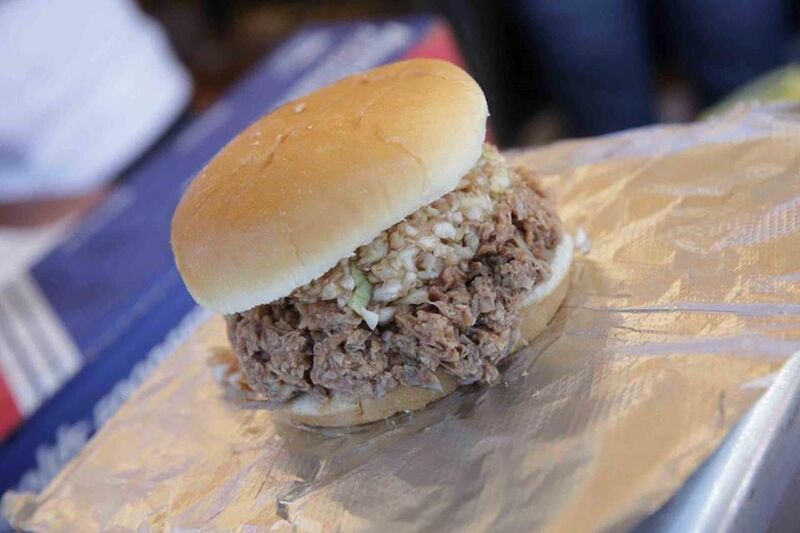 Wilber’s Barbecue in Goldsboro: Wilber Shirley opened his barbecue joint in 1962, and things haven’t changed much since. It’s a favorite stopping point for presidents, and both the late George H. W. Bush and Bill Clinton have come through. More like this: The food scene in North Carolina is one of the most innovative in the country. Here’s proof.